Why was the serpent bad in that garden? Why did Eve give the fruit to Adam, too? Why did God choose Mary to be Jesus’ mom? Why did the people shout to kill Jesus when He didn’t do anything wrong? Why did they slam that crown of thorns down on Jesus’ head and why did they lash His back again and again and again? Why did He die on that wooden cross? Why did the women put burial spices on His body and why did they wrap Jesus in those cloths? Why did Jesus walk on out of that grave? I try to break it all down, this Gospel, and explain it in the language of a four-year-old. But I stumble and trip, throw in words she doesn’t understand and then toss them out again. Start, stop, start over. That’s how it goes. In the minivan, at the dinner table, as we turn the pages of her children’s Bible, as she holds my hand and walks out the door, she asks. Over and over we walk through the Gospel, letting it sink down deep into her heart and mind, and I pray that the seed sewn and watered will sprout faith, strong and true. We adults tend to complicate this Good News, fumbling to unwrap the beautiful simplicity with our overgrown paws. There is, after all, depth here. No matter how down deep we dig into God’s Word, there is rich truth to uncover. Oh, the depth of the riches of the wisdom and knowledge of God! How unsearchable his judgments, and his paths beyond tracing out! (Romans 11:33 NIV). Wasn’t that part of the trouble for the Pharisees, though? They piled on laws, rules, legalism and judgment, tripping people up with their obstacle-ridden path to redemption. They took something simple and made it so difficult. And yet, how capable our God is at breaking down the difficult and complex, making it simple so we, His own precious children can understand. That’s what we need. We need our God to free us from complicated explanations and tricky religious routines. We need Him to be clear. We need Him to break it down. Because when salvation gets complicated, we lose sight of grace. It becomes about us instead of all about Him. We know what a disaster that is. Once we, too, were foolish and disobedient. We were misled and became slaves to many lusts and pleasures. Our lives were full of evil and envy, and we hated each other. 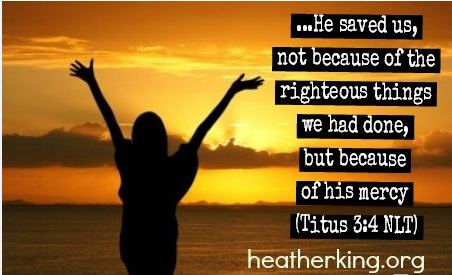 (Titus 3:3 NLT). What a mess we make. Foolish, disobedient, mistaken, slaves to sin, evil, envious, and filled with hate—that’s what we are without God. That’s what Paul writes next. One three-letter word of hope and freedom for all of us chained to sin. It was at Christmas that God revealed His kindness and love, mercifully, generously, with a Savior we didn’t deserve and a sacrifice we didn’t merit. Why did God send a Savior? Why did He come as a baby? Why did He take that crown of thorns, endure that lashing of the whip, die there on that cross? Why did He walk out of that tomb, alive anew? Yes, because of His grace.